We only ask at the end of the year and then only for 8 short weeks. During that time, we try to raise our entire annual budget, an amount that some say is less than half the cost of a starting teacher. But with this amount, we send out motivation, resources, and trends to thousands of global workers each week. Our budget is $17,120/year. So far, friends like you have already given $9,754.11. Unfortunately, only 1 week remains in 2013. We need your help. Would you consider asking your family or church to make a generous gift this weekend? If so, we’d be very grateful. Just click “Donate” in the upper right corner. If only a few dozen readers sent a $100 end-of-year gift, our entire annual budget would be done and, like always, we wouldn’t mention finances again for an entire additional year. Want to help? Click “donate” at the top of any Brigada page, or, mail a check made payable to Team Expansion (Brigada), 13711 Willow Reed Drive, Louisville, KY 40299. Team Expansion is a 501(c)3 incorporation so, for USA citizens, your gift to Christ through Team Expansion is tax-deductible. We’ll quickly send a thank-you note and receipt. We won’t add you to any mailing list unless you request it. Thanks for your prayers, your partnership, and your participation in the Brigada family! Was the 99designs.com contest helpful? Without a doubt. Within 7 days, the contest generated 500 logo design proposals from some 50 different artists. Try it. It’s fun! Have you ever wondered why we put URL’s on a separate line, by themselves, and why we spell out the link instead of simply encoding it in a hidden way, behind the words? First, many Brigada readers tell us they pass along their Brigada to others. Some even PRINT their copy and hand it to non-computer-using friends (because in some cultures, there are still people without access to the internet; they only get it when they visit another town or another friend). If we encoded the link, hidden, behind the words??? Those printed versions would look very useless — because, yes, the word (link) would be a different color, showing that if you click on it in the “live” version, you’d open a web page, but the printed page (on paper) would no longer reveal that link. What’s more, sometimes people copy and paste these items. And when they do, links get jumbled. By separating links between blank lines, we learned (back in 1996, in fact) that the link travels much more safely and securely. 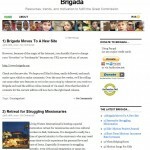 Finally, we here at Brigada believe you should always know where you’re going BEFORE you click. By showing you the exact link, you aren’t clicking so blindly. Our email software distributor (iContact) is one of the “big three,” and they constantly test for spam, but by showing you the exact nature of the link you’re about to visit, YOU get to decide if you want to go there. We wish more in the industry would do the same. Notice that when you add a comment to an item, you can do it totally anonymously. That’s because many of our users live in sensitive places. They’re a bit guarded about giving out their identity. And notice, you can even “subscribe” to a series of comments on an item, even if you don’t want to comment yourself. So in other words, you can NARROW your involvement to just one single item — because it interests you. We believe that’s tons better than being pushed into lots of conversations with which you weren’t really wanting to be involved. And why do we not add more pictures? Easy. Bandwidth. Many of our users are struggling in international locations and their internet pipe is TINY. By keeping pictures to minimum size AND number, we’ve heard, over the years, that they’re extremely grateful. So if you visit someone else’s webpage, you might find it simply BUZZING with exciting flashing banners, ads, pictures and more. Visit the Brigada website, and maybe it’ll look a bit vanilla at first. But … we believe it grows on you. “Clean” is something fairly rare on the internet these days. Anyway, those are our theories — and they seem to be working for us. Ask our 7000 active email readers and thousands more who visit our website. Thanks for being a part of the Brigada family! Want to learn more? Visit our online version and click on “About” or “Submit an item.” Want to give feedback? Just click “Comment” below any item, online, including this one. God bless your week! At this point, our plan is not to add graphics to the emailed edition. Those wishing to see Brigada’s items with graphics will still be able to log on to the website for a more colorful and illustrated experience. Since 1995, our approach has been to receive a limited amount of donations from those who can and wish to give, but to give away our services for free especially for those living in situations in which it’s not as easy to pay subscription fees for a weekly magazine. It’s a labor of love (we never broke even on costs and time invested before and we’re sure not to break even now that we’ll be using a paid emailing service), but thanks to the good folks at Team Expansion who have been willing to help make ends meet when Brigada hasn’t pulled its own weight. For now, essentially nothing. We’ll just let them go idle. If you used GoogleGroups or YahooGroups to read your Brigada online, you’ll still have access to those previous mailings, though, we’re not sure why you’d want to read them there when you could simply read the same archives at the brigada.org website. However, for as long as Google and Yahoo allow, those sites will probably remain untouched. 9) Why are you Using an Opt-In Invitation? Some might have expected us to just port over the whole mailing list — all 10,000 addresses. However, there are certain protocols we value here at Brigada and one of them is — we let you be in the driver’s seat: for subscribing, unsubscribing, and changing your address. What’s more, it’s just more polite to ask first, before we manually force-subscribe your email to a new list. 1) Why does Brigada want to Catch Up? :-) One good friend of Brigada recently wrote, “Instead of going by the date of what issue it should be and trying to ‘catch up,’ it seems better to simply use the current date, whatever that is. It’s kind of like God’s grace. He doesn’t expect us to dig ourselves out of a hole, but gives a fresh start. I can think of several advantages to this. The news is clearly ‘fresh’ news and I think it would be less confusing for readers. For example, if you say you ‘just got back’ from something, or if you announce a seminar to take place ‘next month,’ readers would know it’s in relation to today’s date, not the issue date. Thanks for keeping the info coming.” She makes a good point. But wouldn’t life just be cleaner if we could say, “There’s a Brigada Today filed for every single week that has ever occurred since January 1995.” Wouldn’t that be cool? Got an opinion? Just click on “Comment” below… and while you’re commenting, we’ll be trying to catch up. :-) So maybe soon, the whole discussion will be irrelevant anyway? :-) Either way, see the new tag line that tells both the “official” publication date and the “unofficial” production date. Does that help at all? 1) Woooo-hooooo! We’re finally in May!